A Renault Kangoo van drives along a test track fitted with charging pads. VERSAILLES, France -- As automakers and governments work to add more charging stations to ease electric vehicle "range anxiety," dynamic wireless charging is being touted by Renault as a technology that could eliminate that fear. Dynamic charging allows electric cars to be recharged from pads embedded in the roadway that wirelessly supply power to vehicles driving above them. If and when it becomes widespread, dynamic charging will fundamentally alter the electric vehicle value proposition, participants at a demonstration outside Paris said. However, it will probably be at least 10 years before drivers will be able to use the technology, mainly because of cost limitations. A 2015 study by Highways England, the national road agency, estimated that it will cost 350,000 to 425,000 pounds ($450,000 to $550,000) to equip a kilometer of road with dynamic charging infrastructure. "This technology is really at the heart of bringing electric cars from the second car of the household to the first car of the household," said Eric Feunteun, Renault's electric vehicle program director. Renault has partnered with Qualcomm Technologies and Vedecom, a French research consortium, to develop dynamic charging. 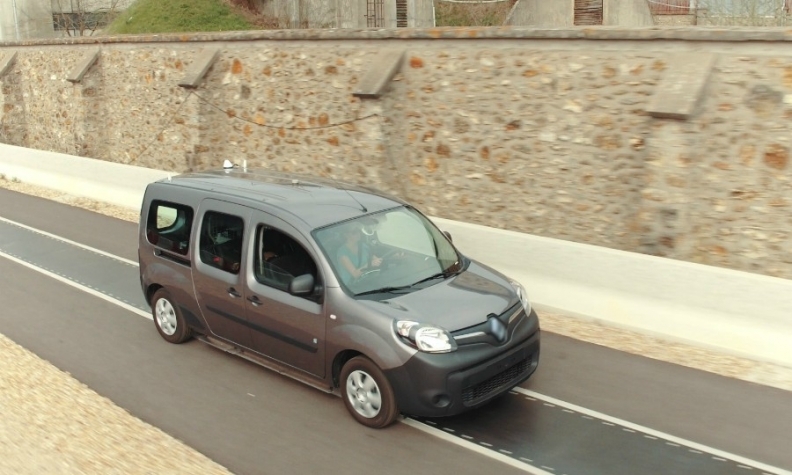 At the demonstration, Renault Kangoo car-derived vans modified with wireless charging components from Qualcomm navigated a 100-meter test track at speeds over 100 kph (62 mph), receiving up to 20 kw of power. The vehicles simulated lane changes, and made passes at different speeds and charge levels to show the flexibility of the system. The building block for Qualcomm's dynamic charging is the company's HALO wireless EV charging, which Mercedes-Benz will bring to market this year in the S500. Electric current flows to a pad placed under the car and is transmitted via an electromagnetic field to a receiving pad on the vehicle. A controller then transmits the power to the car's battery. Aftermarket suppliers now offer wireless charging pads for vehicles such as the Nissan Leaf. BMW says it plans to offer the technology on 5-series models. "Every major automaker has an active wireless charging program," said Steve Pazol, Qualcomm's general manager of wireless charging, who moderated a panel discussion before the demonstration here. In dynamic charging, the pads are built into the roadway. As the car passes over them, they power on and off within three milliseconds, Qualcomm engineers said at the demonstration. Qualcomm, which seeks to license its technology to Tier 1 automotive suppliers, says the system is impervious to weather, and durable because the sensitive and complex components are located outside the roadbed. "Today we have demonstrated that it is feasible, that it is realistic, and it is concrete," said Virginie Maillard, Renault’s head of research and strategy. "Now we have to work on how to partner and deploy this idea at the global level." How dynamic charging will be deployed is not yet clear, participants said. On a typical highway, 50 percent coverage would be sufficient to ensure that motorists will see no net loss of charge, at a minimum, said Luc Marbach, the CEO of Vedecom. He added, "if you want to equip all the roads, it will never happen." Feunteun, of Renault, suggested that 25 percent coverage would be sufficient for urban or suburban traffic. Dynamic charging has won support from the European Union, which has funded a consortium called Fabric to study and develop the technology. Members include Volvo, Scania and Hitachi. Honda has also been working on the technology. Graeme Davison, the vice president of marketing at Qualcomm Europe, said pads could be embedded in steep streets in cities like San Francisco, where power demands are particularly high. "You put it where it makes sense," he said. "It makes life for urban electric vehicle owners much sweeter." Davison said it was impossible to say whether Highways England's cost estimate was accurate, because there were too many variables. "It would be hard to come up with a good, solid figure today," he said. Another practical use would be at taxi stands, especially in cities like London, where all new taxis starting in 2018 must be zero emissions. The Highways England report suggests that transport companies would be early adopters of dynamic charging as diesel-emissions standards become more stringent. Looking ahead, dynamic charging is integral to the widespread use of autonomous vehicles, which Qualcomm's Pazol noted "can't plug themselves in." Fleets of autonomous cars in sharing programs would circulate throughout cities, dynamically charging as they picked up and transported passengers. For automakers, dynamic charging could open up new avenues in design and manufacturing. Costs could be lowered, for instance, because vehicles would not need heavy and expensive high-voltage batteries. "With this system, we are changing fundamentally the equilibrium of energy management," Maillard said. "Instead of transporting a lot of energy in the car, in the battery, we transfer the energy production and delivery in the car to the road."